Kenya’s public debt rose by an average of $16.8m per day between September 2018 and February 2019, as the East African country struggles to pay its creditors and meet its 2018/19 budget. According to the latest figures released by Central Bank of Kenya (CBK), the country’s total debt stood at KSh5.398trn ($53.64bn) in February 2019, up from KSh5.146trn in September 2018 and KSh4.57trn in December 2017. Kenya has already borrowed 66% of the domestic debt target of KSh310bn ($3.08bn) for the year, according to Business Daily, while Treasury bill subscriptions averaged 147%. Kenya’s total public debt crossed the KSh1 trillion mark a decade ago, and stood at KSh1.882trn when Uhuru Kenyatta took over as president in April 2013. A budgetary outlook by Kenya’s treasury estimated that this might grow to as high as KSh7trn ($69.6bn) by 2022, even as the International Monetary Fund raised the risk of default level for Kenya from low to moderate. The government plans to refinance the debut Eurobond, which falls due in June, while it also struggles to pay a KSh79bn loan from a consortium of four banks led by Standard Chartered, and a KSh37bn loan from Trade and Development Bank. Why does Kenya need the money? According to Cytonn Investments, the rising government debt has been driven by “an ever-expansionary budget with the government embarking on infrastructural spending on projects that are expected to develop the country and spur economic growth”. 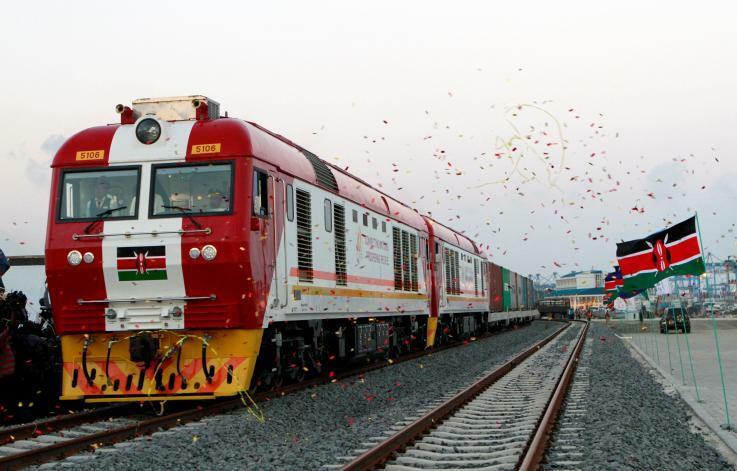 The most visible of these is the Chinese-funded Standard Gauge Railway, for which the government borrowed $3.27bn for the first phase, and $1.5bn for the ongoing Phase 2 from Nairobi to Naivasha. The other main reason has been a shortfall in tax revenues, which have resulted in a widening budget deficit. The current deficit is estimated at 6.3% of GDP, though the Finance Ministry expects it to fall to 5.0% in the 2019/20 fiscal year. The Kenya Revenue Authority has already warned that it will miss its revenue collection targets for the fiscal year. Kenya’s current borrowing spree is from its domestic market, with treasury bonds accounting for 62% and treasury bills 35% by the end of March. In January, the government issued a 15-year KSh40bn bond that had an oversubscription of 255%. In February, it issued another for KSh50bn in five- and 10-year bonds that was oversubscribed by 156%. The Star reported that the government plans to borrow KSh50bn in April. The biggest investors in the bonds and bills have been banking institutions, which increased their stake marginally from 54.48% in September 2018 to 54.81% in February 2019. Pension funds now account for 27.56% of the domestic debt, up from 27.51% in September. The Kenyatta administration says it is working to reduce wastage and graft. In July 2018, President Kenyatta froze all new public development projects until the ongoing ones were completed. His government also increased taxes on mobile-money transfer, bank transactions, fuel, and other commodities. On 2 April 2019, traders in the Nairobi business suburb of Eastleigh went on strike to protest new levies introduced by the taxman on cargo. The Salaries and Remuneration Commission is walking into a storm as it seeks to reduce the country’s KSh700bn-a-year wage bill. The body is looking into reducing the number of allowances for civil servants. It estimated there are a total of 149 different allowances accounting for at least 20% of the wage bill. In March, the public prosecutor estimated that Kenya could have lost KSh16bn in graft in just 10 months, but new cases since indicate that the figure could be much higher.